MVP talk after just five games? It’s never too early to start gauging the NFL MVP race, so we’re doing exactly that despite the fact the 2018 regular season is only 30 percent complete. Here are the top eight candidates who have emerged through five weeks. 1. Kansas City Chiefs QB Patrick Mahomes (last week: 1): He has slipped slightly the last couple weeks, but the second-year No. 10 overall pick has still been the ultimate difference-maker with his arm(s) and legs for the 5-0 Chiefs. 2. 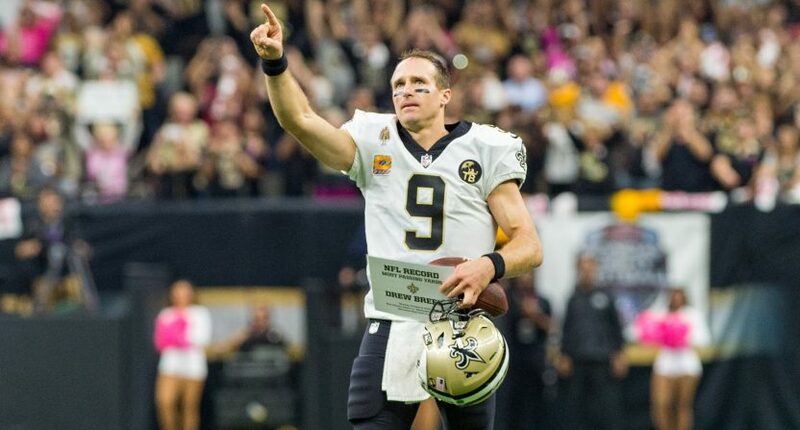 New Orleans Saints QB Drew Brees (last week: 3): Everyone’s talking about the career passing yards record, but Brees also lit up the Redskins in the process. He leads the league in completion percentage (77.9), passer rating (122.3) and touchdown-to-interception ratio (11-to-0). The guy has simply mastered the art of quarterbacking. 3. Los Angeles Rams QB Jared Goff (last week: 2): The league’s second-highest-rated passer leads every quarterback on this list with 10.4 yards per attempt. Most importantly, he was good when it mattered in Seattle and the Rams are 5-0. 4. Rams RB Todd Gurley (last week: NR): The superstar back has scored nine touchdowns in five games, putting him on pace for 28 — a mark only two players in NFL history have hit. 5. Chicago Bears OLB Khalil Mack (last week: 4): Five sacks, four forced fumbles, an interception and a touchdown. And his Bears are in first place in the tough NFC North. Mack is sending a message to Jon Gruden and anyone else who doubted him. Could he become the first defensive player to win MVP since Lawrence Taylor did it in 1986? 6. Los Angeles Chargers QB Philip Rivers (last week: NR): Time to finally recognize Rivers, who at the age of 36 is putting together a monster season. The league’s third-highest-rated passer has 13 touchdown throws to just two interceptions for a team with a winning record through five weeks. 7. Minnesota Vikings QB Kirk Cousins (last week: NR): The big-money offseason addition has put up superb numbers across the board for a team that is primed to take off at 2-2-1. 8. Houston Texans DE J.J. Watt (last week: NR): Where would the Texans be without Watt’s six sacks and four forced fumbles? He was the AFC defensive player of the month in September.